Snow storm is over but it’s still freezing here in Little Elm, TX at 13F. 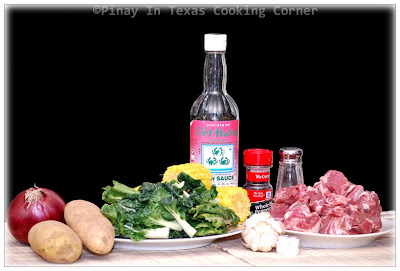 Nilagang Baka is one dish that comes into my mind during cold weather like this. We had it for dinner last night and it was perfect! It is among my daughters’ favorite Filipino dishes, and I love adding an assortment of vegetables in it so it will be healthier for them. They quickly finish their meal and they get to eat vegetables without an argument whenever we have nilaga. Nilagang Baka is literally translated as “Boiled Beef”. 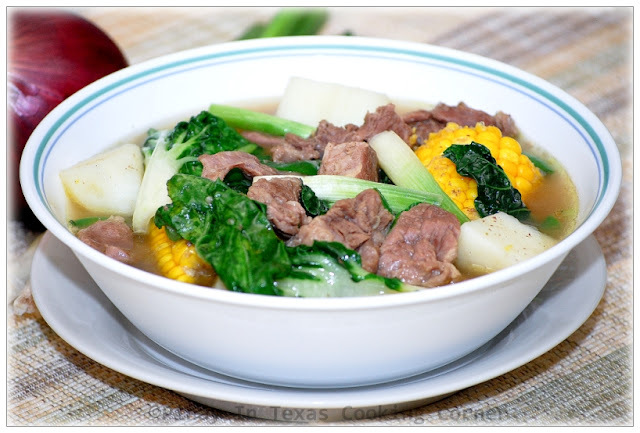 It is simply beef and vegetables boiled together in water with some seasoning. This dish can be served alone or with rice. It is very easy to prepare even for those who are just learning how to cook. It takes almost no effort at all to cook this dish - you just put everything in the pot and let it cook. You have to be patient in tenderizing the beef though. If you are in a hurry, you may use pressure cooker to tenderize the beef. This is a simple yet so good and nourishing dish that you should try! 1. Place beef in a big pot . Add enough water to cover the meat and bring to a boil over medium low heat until scum appears on the surface. Remove all the scum or brown bubbles that will form on top of the soup. 2. Add garlic, onion, peppercorns & beef cube. Cover and simmer until beef is tender, approximately 1½ hours. Test for tenderness. Remember that tenderness varies depending on the cut of beef you’re using. Add more water if necessary, i.e., if they have to be cooked much longer. 3. Add corn cobs. When almost done (approx. 10 minutes), add potatoes. Simmer for 5 mins or until potatoes are half cooked. 4. Add string or green beans and fish sauce. Simmer until green beans are almost cooked, that's about 5 minutes. 5. Add pechay and green onions. Add salt if needed. Simmer for 3 more minutes. 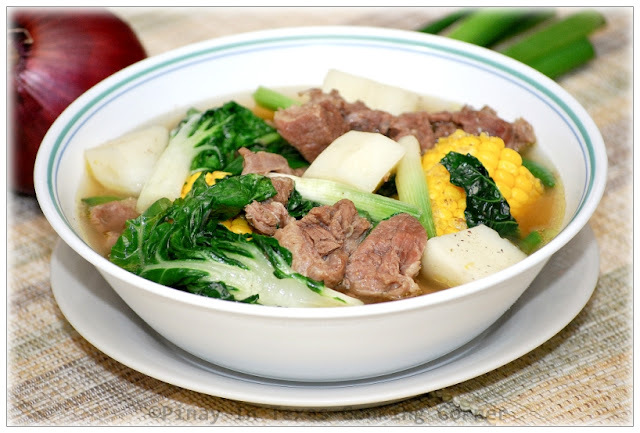 Note: Other vegetables that you can add to your nilaga are cabbage, napa cabbage, & Taiwan bok choy. Some add carrots, & plantain/saba bananas, but I don’t. I love carrots & saba but they tend to overpower the taste of the beef taking away the supposed to be beefy flavor of your nilaga.